The best way to explore the area is by car. 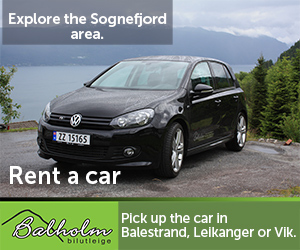 You can rent a car in Balestrand at Balholm Rent a car. 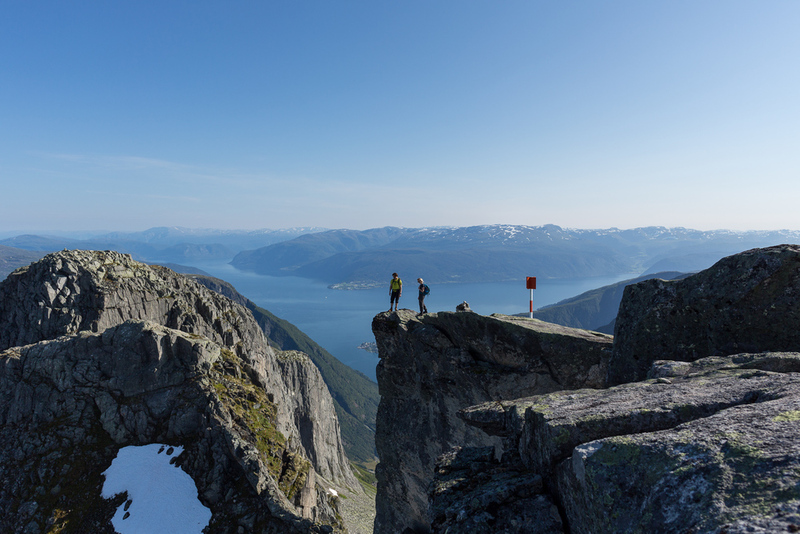 The viewpoint on the mountain pass, Gaularfjellet, is 37 km (23 miles) from downtown Balestrand. Here you can admire the mighty landscape. 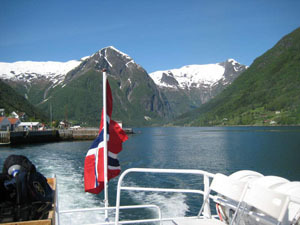 Balestrand Tour offers guided exursions to the viewpoint Utsikten. The mountain pass Gaularfjellet is a National Tourist Route. 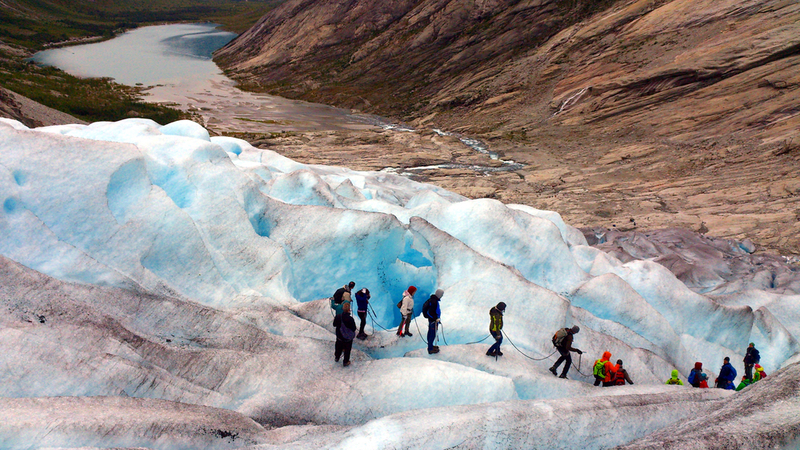 The Fjærlandsfjorden: the only fjord in the world where you can explore both fjord- and glacier landscape. The narrow and beautiful Fjærlandsfjorden is surrounded by steep mountains, and stretches all the way to the majestic glacier Jostedalsbreen. 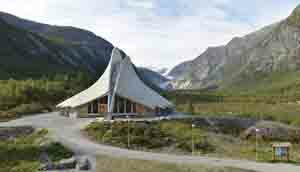 In Fjærland you will find Norwegian Glacier Museum, and a short way to the glacier. 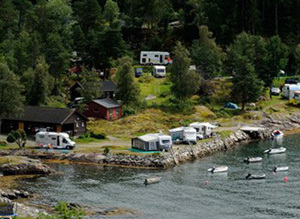 Boat from Balestrand, and a bus waits for you in Fjærland. 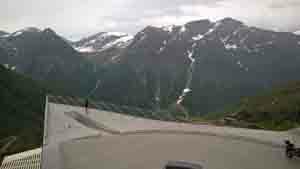 You can also reach Fjærland by car. 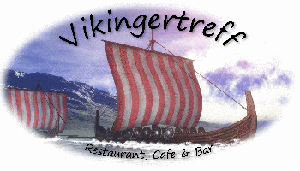 Info on sognefjord.no. More info and tickets here. In Vangsnes, just across the fjord from Balestrand, is the statue of Fridtjof the Bold. The statue is 10.5 meters (34 ft) high and is situated on a 12 meters (39 ft) hight platform, given as a gift by Kaiser Wilhelm II who uncovered the statue on 31 July 1913. 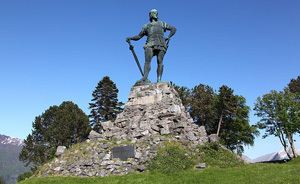 The Kaiser also gave the statue of King Bele in Balestrand. Read more about this amazing story. Hopperstad Stave churck is located in Vik, just across the fjord from Balestrand. 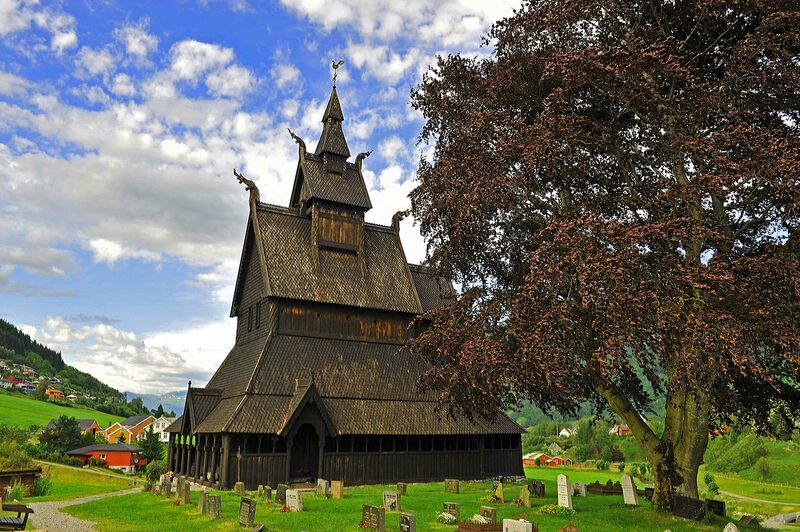 The church is from around 1130, and is unchanged since th 17th century. It was restored in the years 1885-1891. 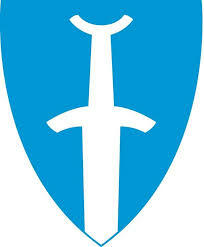 You may go by boat, or drive 31 km (19 miles) + ferry 20 minutes, or hire a car. More about stave churches in the area here! Guided hike from sealevel to the top of Keipen, 1417 meters (4649 ft) above sea level. Spectacular and amazing view of the fjords and mountains. 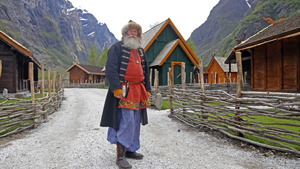 Njardarheimr - discover the viking village in Gudvangen. 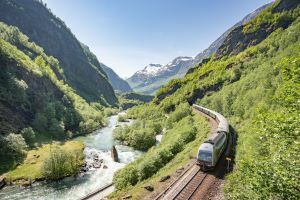 The Flam railway has been named one of the most beautiful train journeys in the world and is one of the leading tourist attractions in Norway. In the span of a short hour the train takes you from sea level by the Sognefjord in Flam to the mountain station Myrdal 867 meters above sea level. Myrdal is also a station on the Bergen Railway, which means that the Flam Railway corresponds with trains on the Oslo - Bergen line. The Flam railway is one of the steepest railway lines in the world, max gradient: 1:18. The train runs through spectacular nature. You may go to Flåm by boat or by car. 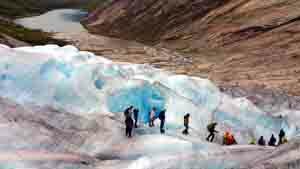 Guided glacier hikes in Jostedalen. 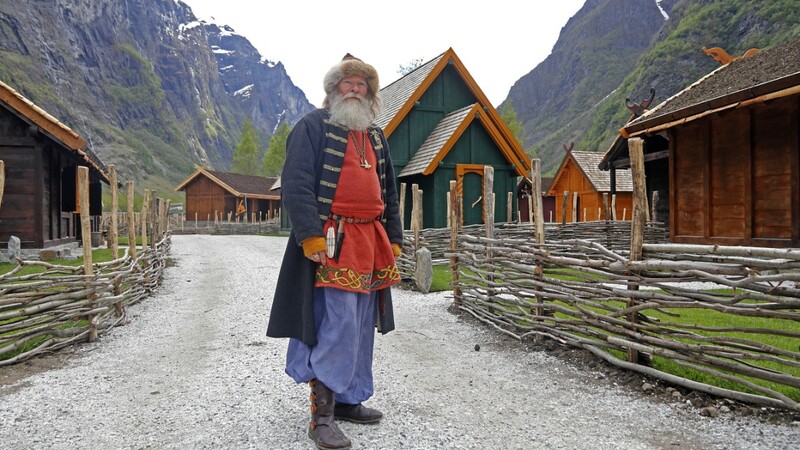 You will need a car to get to Jostedalen. 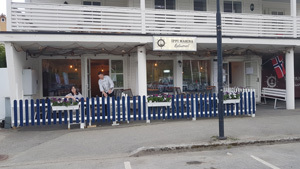 You may rent a car in Balestrand. 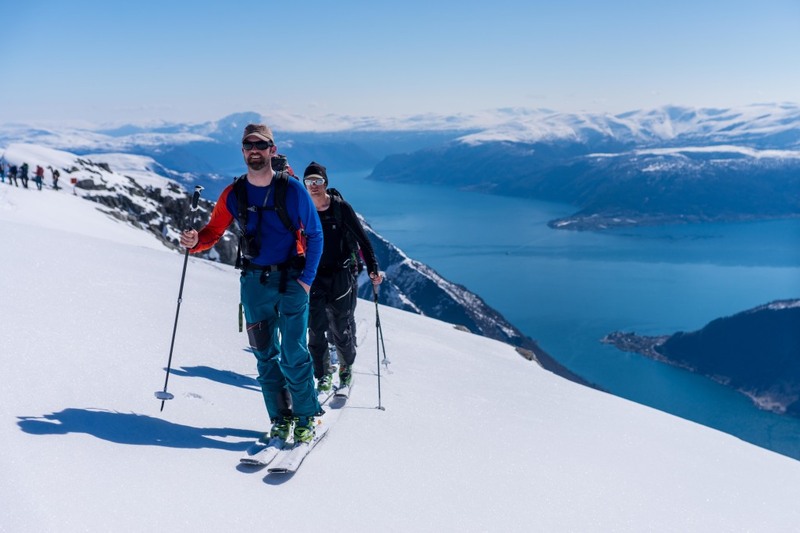 Bre og Fjell (Glacier and Mountain) arrange excursions on the glacier and in the mountain, on foot and on skis. 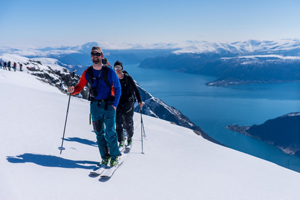 Excample: The Sognefjord Alpine Traverse - on skis from Sogndal to Balestrand.